Gathering remnant with a crew of dogs has always been a favorite chore of mine. Like most sporting events, a little hard to explain on the financial spread sheet but highly justifiable in my mind. The following events took place on some remote real estate of a mountainous nature and there sure was plenty of it. We’d been successful on our first gathering efforts that I and the puppies had attempted. The cattle were wild but not spoiled so I was patting myself on the back. It looked like I’d made a management decision that was going to show a huge profit for a change. Staying horseback and looking for illusive cattle can be very expensive if you are a clock watcher. This was turning out to be one of those situations where I was spending more time riding and looking for cattle than I was actually working cattle. It sure was pretty country to be riding in while you were looking for cow sign. I’d found some really neat country that I hadn’t ever seen before but it wasn’t looking too good as far as the job of locating cattle was concerned. I was about on the back side of the circle I wanted to make when I ran across some fresh sign going down the canyon I was in; looked to be several bulls all headed to water. I stayed with the sign for nearly an hour or so before I spotted the bulls. Four of them were grazing on a hill side straight ahead. I didn’t recognize them but it sure looked interesting. I was wanting to get a closer look but it was best for me to just sit still. The dogs were acting like they knew what was up so I thought I would give them a chance to see what they could do. It was cool and they’d watered not far back so I sent the puppies after the bulls. I knew it was a long way for the dogs to go on their own but I figured I’d give them a chance; that’s how they learn. None of these dogs were very good at trailing but they would smell the bulls if they got close enough. I just stayed put and proceeded to watch the show. I had a good view of the whole performance. 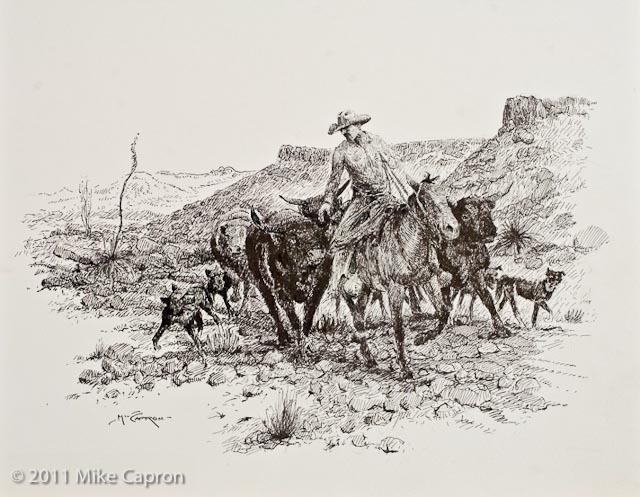 The dogs went straight to those bulls so fast that by the time the bulls saw the puppies coming it was too late; they didn’t even try to run. The dogs threw them together right away and went to work on them. At first the bulls wanted to fight but a few good bites on the nose and top of the head cured any more ideas of fighting. I let the dogs have them for a few minutes until they gave it up and were satisfied to stand still. I started moving toward them watching all the time in order to check their reaction. When they saw me, they got very nervous, but the slightest move brought the dogs to fighting position and the bulls got back together and stayed put watching the dogs. The closer I got the more the bulls tried to leave but the dogs held them. I made every effort not to put more pressure on the bulls than necessary. It wasn’t long before the bulls figured out that I was going to be their friend if they didn’t run off and I was surprised at how attached they became. I had four full grown fifteen hundred pound fearless bulls surrounding me and expecting me to protect them from those thirty-five pound, black and white snapping little canine devils. Which I did as long as the bulls followed me wherever I went. It was a sight to behold, I was the proudest cowpuncher going. I could see a picture of this on the cover of Western Horseman or maybe even Sports Illustrated. You would have thought I was General Crook and had just captured Geronimo!! I was so confident that these bulls would stay with me through thick and thin, no matter where I went, that I decided to take a short cut to the shipping pens. By this time, It was late and it was seven or eight miles through rough, broken rim country to the shipping pens. I knew once it got dark this project was over and I needed to make a showing for all the effort. So I thought I would take that short cut, a rough one, but I didn’t see any reason why it wouldn’t work. There was a trail that went straight down off the rim on an old pipeline right-of-way. The bulls were being complete gentleman and I had a good mile to go before we dropped off the rim with plenty of time to settle them and check out their attitude. I had never had cattle so comfortable with my presence. They were completely confident in my directives and never looked for a chance to escape. I thought there might be some hesitation when we got to where the descent started, but they never missed a step right behind me and off we went. It was steep but not narrow or dangerous. I thought it would slow them up some as going downhill usually does to bovine. There were very sharp broken rocks but the bulls never noticed. The farther we went the faster we were going. I was having a hard time holding all of them because there were too many passing lanes. My horse Alpo was doing his best to stay in the lead of four bulls abreast going full steam ahead. They weren’t disrespectful as much as they were enjoying the race and wanted to take the blue ribbon. It seemed Alpo was into the race also and doing his best not to take second place money. He was doing a fine job of negotiating the track conditions and I was sure that the best thing I could do was to give him slack and ride. We were nearly to the bottom and any pulling now would be like hauling on a bridle hooked to the cow catcher of a locomotive. The bulls had lost total respect for me and were into the race as if that were all that mattered, just running. The dogs were in our dust and wondering what was next……… Me too!!!! I managed to get back in the lead hoping that the bulls would slow up and give us a chance to regroup. They did slow up but then scattered like a bunch of quail being shot at. I decided to see if I could get the two slower ones to hold up and catch their breath. Maybe I could salvage something out of this wreck. They held up after some time and were once again showing respect but they were too hot and stepping on their tongues trying to get their breath. I had them held up together and stopped but was convinced they were done.That’s not a bad situation to leave for the next time. In an effort to salvage something and get to the pens with a showing, I went looking for the other two. The country was easy traveling with greasewood gravelly covered hills. Alpo was game as a bear. He had caught his breath so I was letting him roll. It wasn’t long and I could see the other two bulls still together traveling with their heads high and showing no sign of weakness. They were headed in the right direction and I was content to follow but not too close. I didn’t want to add any more pressure and hopefully they would slow up and cool down. I rode high and just barely in sight of them. It was still more than three miles to the pens and I thought there was a good chance we might get these two penned. My dogs had run out of steam but if I could find a water trough, they would be ready to go again. The bulls hadn’t slowed much and I hadn’t put any pressure on them when we came close to the pens. I was amazed how strong they were, showing no sign of weakening. I eased up in front of them in order to turn them towards the corral gate which was still about a half mile away. The puppies were pretty hot as we had not found any water. They sure needed a drink but there was no way to go to water and leave these bulls. Going to the pens wasn’t on the bulls’ minds and they proceeded to turn very disrespectful; hot and mad were the only words to describe them. I wasn’t able to slow them up enough to give me time to come up with a plan or give the dogs a chance to help. I sure didn’t see any sense in roping one or both of them. They were too hot for that. Alpo was still game but somewhat spent. I sure didn’t want to give up here as I knew the bulls would consider it a major win for their team. One bull was a little older and showing to be the leader as the other bull was content to stay with him. But the older bull was dead set on going straight away from the pens and hooking anything that got in his way. After getting in front several times to stop him, he changed his mind from flight to fight. Alpo was doing a good job of dodging his charges but we weren’t changing his mind and he was getting more aggressive with each charge because I was sure giving to his pressure; he was running the show. Only one thing left to do. The last resort, shoot him in the horn. Not a real easy task but when successfully done, this is the most convincing mind alteration a bull ever had. One or two very important preliminaries before you pull the trigger: #1, Be in close enough to put pressure on him just before he charges. #2, Holler as loud as you can some preparatory command like, “Hey Bull!”, just before you pull the trigger so your command will be on his mind when the bullet slams into his horn. Nothing makes a bull give like a .45-caliber slug going through his horn. This is not a final cure, just a mental adjustment and something to impress him so his anger might not pay off. The bullet hole does not bleed or cause any physical damage, although one horn will end up a little shorter than the other. It’s just a blow delivered with such force that’s so impressive to the bull because he isn’t sure how you delivered the slam from such a distance. He will forever associate it with the preparatory command “Hey Bull!” All of this was the beginning for establishing proper herd manners. 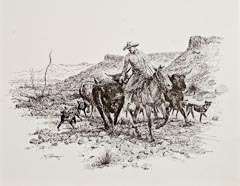 After he regained his composure some, I rode up to face him again with my arm up as if I had my pistol ready and hollered,“Hey Bull!” The second he began to turn away from me, I turned also and rode to the house. I returned the next day to find him and his friend gone, of course. They had changed country. It took me a week to find them but when I did it was perfect conditions; cool, comfortable and my dog crew were all watered and rested. The big bull was with a few cows and calves but no sign of the little bull. I let the puppies go to them, throw them together and hold them. Letting the cattle settle some, I rode in. I rode around them checking Mr.Colt45 out to see if he still wanted to be disrespectful. He was a perfect gentleman but I made sure he understood that the most comfortable place for him was in the middle of that herd of cows. I spent every day for a week with this little bunch of cows and the big bull. It was time well spent. The little herd was a good set of cows and the big bull was a true monarch. I had a nice trap that I moved them to for the time being where I could come check on them regularly. When I gathered other good producing cows and calves I could throw them all together and let the puppies school them on proper herd etiquette. It wasn’t long before I had too many cows for my big herd sire; Mr.Colt45, but I couldn’t find one better qualified. In time, I cleaned that part of the ranch of all cattle. I’d added enough cattle to my gentle herd that the trap was getting crowded, so I moved them out to the big pasture. I had also found some good young bulls to add to the herd. Mr.Colt45 schooled on them also, teaching them their respectful distance; it was a nice bunch of cows. All had calves and not a barren cow in the bunch. Since they were all native cattle it was only natural for them to locate in their new home and concentrate on raising good strong babies. They were always manageable with dogs and remained a nucleus, developing into a very productive herd of cattle. That’s as good a paycheck as there is for a man and his dogs. Lyn And Carrol Yater on September 30, 2011 We love everything you do, Mike. You are one of the most talented men we know, and the other one is Wilson. Now, Anne and Katie are the Saints, though! !